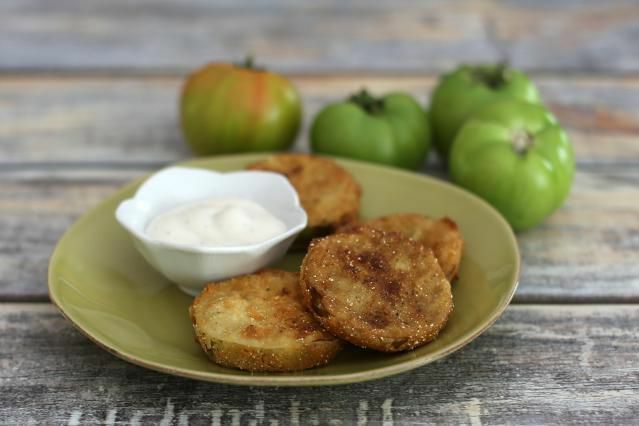 If you're not a Southerner, you might first have heard of fried green tomatoes in the title of Fannie Flagg's book "Fried Green Tomatoes at the Whistle Stop Cafe" and the Oscar-nominated movie made of it that name charmed just about everyone. You might have been left wondering just what green tomatoes are. There's no mystery to it. They are simply unripe red tomatoes. There are some types of tomatoes that are naturally green when fully ripe, like Green Zebras and Green Moldavians, but those are distinguishable from unripe red tomatoes. Sometimes green tomatoes are intentionally picked before they ripen, but often, they are tomatoes that just didn’t ripen by the end of the growing season. Some home gardeners who grow tomatoes for that fresh-picked, backyard-to-table flavor regard them as failed attempts at red tomatoes, but they shouldn't be sold short: There are many delicious uses for a green tomato. Set out a plate of flour. Place cornmeal, or breadcrumbs, or a mix of the two on a plate and season with salt and pepper. Cut large green tomatoes into thick slices and dredge each one in the flour to coat, then into the egg and milk mixture and then the crumbs or cornmeal until each slice is fully coated. Fry in a heavy pan coated with cooking oil until they are browned on both sides, just a few minutes on each side. Do not crowd the pan; cook in batches if your pan is not large enough to hold all the slices at once. Mixing all the ingredients to make a batter to coat the tomatoes rather than dredging through the flour, milk and the crumbs separately. Fried green tomatoes can be served with a dipping sauce, such as sriracha mayonnaise, spicy chipotle mayonnaise, or a Louisiana remoulade sauce. Or, you can use them in a sandwich, such as instead of ripe tomatoes in a BLT. When you have a bumper crop of green tomatoes at the end the season, you might consider turning them into pasta sauce and freezing it for future use if you have enough. There are many recipes for green tomato pasta sauce or pomodori verdi (in Italian). It is easy enough to substitute green tomatoes for red in your favorite from-scratch sauce recipe and see how you enjoy the results. Some variations that play on the "green" flavor add mint, dill, or arugula. As you’d expect, green tomatoes have a less mature taste than the red kind, with a hint of sweetness. Some people think they taste somewhat like zucchini. There are enough ways to use green tomatoes that you can serve them with every course of an end-of-summer dinner.